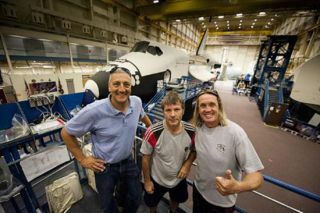 Members of the English heavy metal band Iron Maiden stopped by NASA for a visit around the astronaut headquarters. L to R - Michael J. Massimino (Astronaut), Bruce Dickinson (vocalist and Airline Captain), Nicko McBrain (drummer). The heavy metal rockers behind the British band Iron Maideninvaded NASA's astronaut headquarters this month for an all-access look at howAmericans practice for flying in space. Four members of the iconic heavy metal band scoped out spacestation mock-ups and a space shuttle simulator during a VIP tour of NASA'sJohnson Space Center in Houston. Astronaut Michael Massimino, a veteran of three spaceshuttle flights, hosted the Iron Maiden band members, who were in Houston aspart of their "Final Frontier Tour" of North America, with shows in Dallas,Houston and San Antonio. The band follows a long line of dignitaries who havevisited the space center, included their QueenElizabeth II, who stopped by in 2007. "Having a visit from Iron Maiden was great fun,"Massimino said in a statement. "It was a pleasure to meet them and theyare big fans of the space program. It was an honor for NASA to host them and abig morale boost for the entire NASA team to have Iron Maiden at the space center." Iron Maiden vocalist Bruce Dickinson said meeting Massiminowas a treat. "We appear to have a lot of fans at NASA, and it was areal pleasure to meet some of them, especially, of course, a bona fideastronaut who has made a number of spacewalks," he said. "Hearingfirst hand of Michael's experiences was fascinating." Massimino gave the heavy metal musicians a look the varioustraining simulators typically reserved for astronauts at the Johnson SpaceCenter, including a look at some older spacecraft. "He took us round the space station and shuttle and upclose to the incredible Saturn 5 rocket," Dickinson said. "Fansworking in the Mission Control room had even put up pictures of the band on thehuge screens where you would normally see the rockets taking off!" For Dickinson, what most resonated from the visit was thepoignancy of being in the room where the Apollomoon landings were directed. "The highlight was unquestionably the Apollo Room, fromwhere the moon landings were coordinated," Dickinson said. "Lookingat the relative simplicity of the equipment compared to today, it is amazinghow they managed to pull it off." The rockers also got to join in a little fun at the famousspace center. "Each of us even got to take off, fly and land the space shuttleon the simulator, a real thrill," Dickinson said. "We felt veryprivileged and hope that Michael and our NASA fans enjoyed our Houston show asmuch as we enjoyed our visit with them." Following the North American Tour, the band will then shiftover to Europe for a series of major festivaland stadium shows before taking some time off and returning to tour morecountries in 2011.